White Shirt, Deep Navy-Blue shorts/trousers, School-Tie, School-Badge, School-Belt, White Socks and Black Shoes (with lace), Deep Navy-Blue Pullover / Blazer (in winter). Deep Navy-Blue tunic. White blouse, School-Tie; School-Belt; School-Badge (upto Class – VIII). School-Badge, White Socks / White Knee High Stockings for (Class: Nursery I – VIII) Black Shoes. Deep Navy-Blue Pullover / Blazer (in winter). Deep Navy-Blue Blazer (in winter). White Salwar, Green & White Checked Kameez, School-Badge, White Socks, Black Shoes. BOYS wearing bell-bottom / low hip / ill fitting trousers with funky hair-style, beard / side burns may not be allowed to enter the school. GIRLS wearing tight-fitting dress with unmanaged loose hair may not be allowed to enter the school. The students should strictly follow the dress-code as laid down by the Management of Orient Day School. Any violation of the following directives shall invite serious disciplinary action against the student. Should wear properly tailored school uniform. Tight-fitting, indecent school-uniform will not be allowed. Hair should not be left loose. It must be neatly managed with black ribbons/bands/clips. Fancy hair styles, application of gels, hair dyes (except black) will not be allowed. Black shoes should be properly cleaned everyday. High-heel footwear will not be allowed. Use of cosmetics should be very minimum. Use of perfumes, lipsticks and eyeliners are strictly prohibited. Dopattas should be used compulsorily with Salwar-Kameez. Should wear properly tailored school uniform. Trousers should not be too tight or too loose to look like bell-bottom or jeans. They must be formal in design (pleated at the waist with straight side-pockets). Black shoes (laced) should be polished regularly. Any fancy shoe will not be allowed. School-uniform should be washed and ironed regularly. Shabby dresses, dirty dresses will not be allowed. Hair should be regularly trimmed. Fancy hair styles, application of gels, hair dyes (except black) will not be allowed. Senior boy students must have clean shaven faces. All the Class Teachers and the subject teachers shall meet all the parents of their respective classes as per schedule to be given in the Notice Board at least 15 days before the Open House programme. The parents are cordially invited to attend the meetings, have discussions with the teachers regarding the problems of their wards and co-operate with the teachers. Any Parent or Visitor, wishing to see the Principal on any urgent business may meet him between 12-00 noon and 1-00 p.m. on Saturdays only. Regarding studies or any allied matter, the parents are advised to intimate the same to the Principal, through letters or e-mail (ods34@outlook.com). The Principal shall take necessary steps or, may invite the parent concerned on an appointed day. Such letters with address and contact nos. of the parent are to be dropped in the Enquiry Office. Guardians, aggrieved on any ground, are requested to see the Principal personally by prior appointment instead of airing their grievances in public or in front of the School Campus which creates confusion and chaos amongst other guardians leading to development of not too cordial a relation between the guardians and the school authorities. The guardians should refrain from uttering comments or doing things that are detrimental to the interest and prestige of the school. Violation of these rules on the part of a guardian might lead to expulsion of his/her ward/s from the school. On no occasion should a guardian try to see any member of the school Management or the Principal at their residences. In all matters of the school, the Principal’s decision is final and binding. Students of Classes XI & XII (Science) shall have to pay a monthly fee of Rs. 500/- as Laboratory Charges. All students of Class XI (Science) shall have to pay a Refundable Caution Money Deposit of Rs. 500/- at the time of Admission. It is to be noted that if any student damages any Laboratory equipment, proportionate amount of money will be deducted from the Caution Deposit. Parents and Guardians are informed that for their convenience as well as for the convenience of the School Authorities, all payments (other than the payments for Diary, Badge, Exercise Books, Ties Belts, etc. and Text Books) must be made by A/C PAYEE CHEQUES payable to ORIENT DAY SCHOOL. Cheque payment will not be allowed 15 (Fifteen) days before commencement of any examination and/or publication of Examination Results. In case of ‘cheque-dishonoured’, the student shall be treated as a Defaulter and shall not be given the admission cards / results till the ‘cheque-amount’ is paid in cash along with the requisite Bank-charges. The School fees are to be paid on or before the 10th of each month between 8.00 a.m. and 2.00 p.m. on working days. Defaulters will be charged @ Rs. 1/- per day. After two months the name of the student who is a defaulter may be struck off the School Register. Re-admission may be granted at the discretion of the Principal. The tuition and other fees for the period during the Puja Vacation (September-October) and Winter Vacation (December-January) are to be paid in advance respectively, with the tuition and other fees for the proceeding months. Students should come to school neat and tidy. The prescribed School-Uniform is to be worn on regular school-days and in school functions/excursions. Students must not bring Mobile Phones inside the school on any pretext whatsoever. Students will be searched at random as per discretion of the Management and if any mobile phone is found it will be confiscated and will not be returned on any plea. However, the mobile phone will be returned to the owner when he/she leaves the school permanently with a School Leaving Certificate. Chewing:- gums, tobacco, supari, gutka in the school premises is strictly prohibited. Students must be normally punctual. Students will only be permitted to enter the school premises 10 mins. before the school starts. Students coming late by 10 mins. or more may not be allowed to enter the school for the day. Irregular attendance, habitual idleness, neglect of home work, disobedience and disrespect towards members of the staff or bad moral influence justify dismissal. Pupils are responsible to the Principal for their conduct both inside and outside the school. Students who might be absent on the previous day/days, must bring a written explanation from their parents to the Principal. During the absence of a teacher in a classroom, the pupils must obey the monitor appointed. The Principal may send any student (above Class IV) home during school hours for any breach of discipline. Students will be fined for any sort of vandalism like destruction of electrical fittings, bathroom fittings, furniture of the school. Parents are expected to co-operate in the work of the School by enforcing regularity and discipline and by taking interest in their children’s progress. Parents should check the school diary regularly and note the teachers’ remarks. There will be three major examinations, viz. First Terminal Examination, Second Terminal Examination and Annual Examination. The Subject teachers may also take weekly/monthly tests. A student is generally promoted to the next higher class on the basis of the result of the Annual Examination. A student who fails for two successive years in the same class shall be given a Transfer Certificate. Special arrangement cannot be made for pupils who, for any reason are absent from examination. The Principal, while taking disciplinary steps against any student either by himself, or on the advice of the House Masters or the members of the Board of Discipline, or the Class Teachers, does not bind himself to give any explanation except to any competent authority. Parents are requested to communicate with the Principal by letter or e-mail (ods34@outlook.com), see him personally by prior appointment, on matters concerning the progress and welfare of their wards. Parents are not allowed to see their wards during school hours without special permission from the Principal. The result of Annual Examination of the defaulters will not be published. All dues should be paid before the commencement of the Annual Examination. Parents are requested not to interview teachers during school hours without prior permission from the Principal. They are further requested not to ask the teachers about the performance of their wards at different examinations before publication of the result. Students are responsible for safe custody of their books and belongings inside the school. The parents are requested not to allow their wards to carry costly and dangerous articles to school. An Identity Card is issued to every student for important reasons. Old students must have their Identity Cards renewed in every academic year. Parents must bring the Identity Cards of their wards at the time of taking them home. The Identity Cards supplied by the School should be deposited to the Office for the Principal’s Signature, after filling in and affixing a recent passport size photo of the student within seven days from the commencement of the New Session. Old students must pay the Annual Charges and other dues before the commencement of a new session within a stipulated date to be notified at the end of Annual Examination, failing which their names will be removed from the school Register and they will have to seek re-admission. School satchel, bags, cases are compulsory. Provision is made for Sports and Athletics. Pupils should participate in games when required to do so. Pupils may be required to take part in cultural activities as Debates, Dramatics, Music and Singing particularly when school functions are arranged. Participation in such functions will be deemed compulsory by the Principal. School-Badge, School-Tie, School-Belt, Exercise Books, Identity-Cards, School-Diary, etc. are to be purchased from the School’s Cheap-Stores. Parents, Guardians and Visitors are requested and advised to correspond, if necessary, through letters or e-mail (ods34@outlook.com). Letters are to be dropped at the School’s Enquiry Counter. The Principal does not meet any parent / guardian on school matters at his residence. Therefore, parents and visitors are earnestly requested and advised not to contact him at his residence either in person or over phone on school matters. The new session for the respective academic year starts on middle of April, Every year, for Classes Nursery-I to Class XII. Reporting Time of Students: 6-30 a.m. Classes start at 6-45 a.m.
Nursery – I, Nursery – II & Transition 9-45 a.m. Classes – I & II 10-20 a.m. Classes – III & IV 10-55 a.m. Reporting Time of Students 11-05 a.m. Classes start at 11-15 a.m.
Day Session students will not be allowed to enter the School Building before 11-05 a.m. THE SCHOOL REMAINS CLOSED ON THURSDAYS & SUNDAYS. Students will be fined for any sort of vandalism like destruction of electrical fittings, bathroom fittings, furniture of the school. The Principal does not meet any parent I guardian on school matters at his residence. Parents & guardians are requested to send their wards to school and collect them from the school according to the School Time Schedule give above. The Principal / School Authorities reserve/s the right to change/alter School-Timings and in such case/s prior intimation shall be given to all concerned. 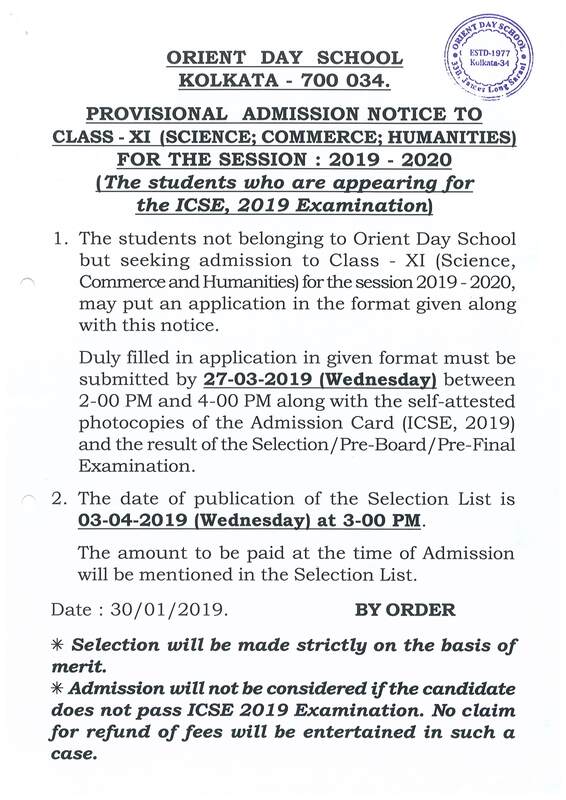 As per the ISC Council’s Rules, ICSE & ISC students having less than 75% attendance at School shall not be permitted to sit for ICSE and ISC Final Examinations without formal permission of the Chief Executive & Secretary of the Council. Henceforth, the School authorities shall follow the same rule for all students from Classes III to VIII. Students of Classes – IX, X, XI and XII may be barred from appearing in the school’s examinations if their percentage of attendance falls below 60%. NO HALF DAY OR EARLY LEAVES SHALL BE GRANTED OTHER THAN EMERGENCIES ONLY. 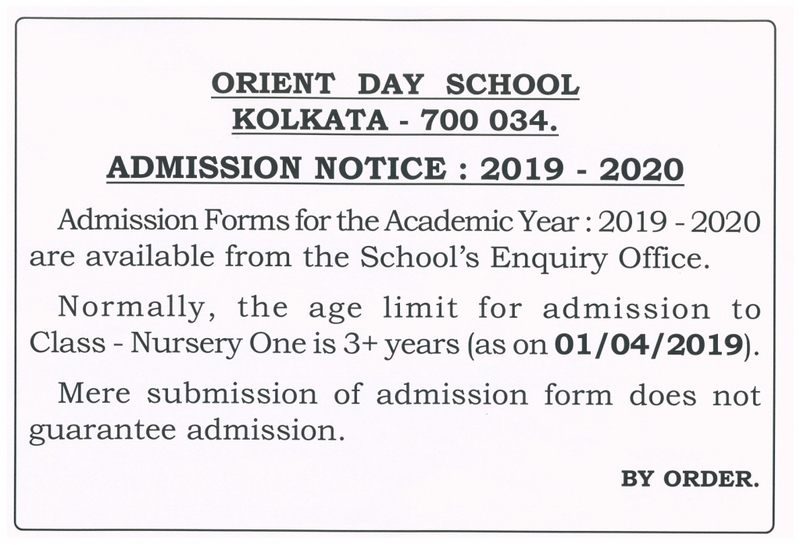 Application for both short and long leaves, should reach the School, addressed to the Principal, Orient Day School, through the Class Teacher concerned. The name of the student in full. The full signature of the parent or guardian. Whenever a student is ill for a long period, an application from the Parent and a Medical Certificate (in original) from the attending Doctor, should be submitted. Submitting only Medical Certificate, as is often noticed, is advised against. All letters and applications addressed to the Principal must be neatly handwritten/typed in A4 size paper/s, put in an envelope with all the contact details of the applicant and submitted at the school’s Enquiry Office. Applications for Transfer Certificates, if required, should be given in the prescribed format. A clear notice for one month is to be given by the parents before the issue of a Transfer Certificate. No Transfer Certificate will be issued to any student until all dues to the school are paid in full. In case of Emergency, the Principal may apply his discretionary power to issue Transfer Certificate to a student within 7 days from the date of such application from the parent concerned. But in such a case the parent shall have to pay one month’s fees during which the ward shall not be a student of this school. A pupil’s name may be struck-off the School Register if he / she is absent for 15 days or more without written permission of the Principal. Students who will fail twice in the same class will be served with a T.C. A student may be given a forced T.C. for serious breach of discipline or gross misconduct. Parents who are in need of Inter-State/ Inter-Board Transfer Certificate for their ward/s must have to wait for at least one month from the date of submission of the application for Transfer Certificate. Ordinary Transfer Certificate may be available within one month from the date of application.